NOTE: SmartParts is closing shop. Do not buy this product unless it is on sale. Short Version: A built-in e-mail address for sending photos directly to the frame and a gorgeous 8-inch screen barely even out the shortcomings of the SmartParts SPX8WF digital photo frame. The SPX8WF took less than a minute to hook up and within about five minutes, I had pulled down some photos that I’d e-mailed directly to the frame and had them cycling through as a slideshow. Each frame has a cryptic four-letter e-mail address to which you send e-mail messages with photos attached. The whole process is painless, especially since almost everyone knows how to e-mail photos as attachments. Sending huge files isn’t a big deal, either, as the frame will automatically shrink them. The frame itself is built well and would look really nice in just about any room. 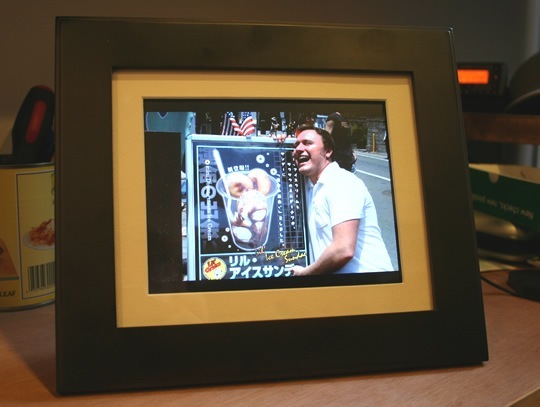 We’ve had company over a few times since I started testing this frame and everyone’s been startled to see the pictures on the frame suddenly change. They’d all thought it was just a normal photo frame at first – so big points for blending in. The 8-inch 800×600 screen is bright and colorful. Photos look great; you won’t be disappointed on that front. You’ve also got plenty of different methods for getting your photos displayed on the frame – I actually found that using Microsoft’s FrameIt service worked best for me because it allowed me to pull in my Flickr and Picasa photos as RSS feeds, so anything I uploaded to those photo sites showed up on my frame. Aside from e-mail and FrameIt, you can also just plug in a memory card filled with photos and they’ll start playing automatically. Aside from photos, the SPX8WF can play low-res videos and standard music files if you really want to use a frame for that stuff. While the e-mail feature is nice overall, it falls short as a useful function due to the fact that you have to manually check the frame’s e-mail address in order to pull down new photos. First-time e-mail addresses that send photos to the frame have to initially be authorized, which is good, but once authorized, new photos from familiar addresses won’t just automatically show up in your frame’s slideshows. On a somewhat related note, you have to pick your pony as far as how you’re going to store all your photos. If you’ve got e-mailed photos, FrameIt photos, and photos on a memory card, you can’t view them all at once in a big, fat, everything slideshow. You can view all the photos that have been e-mailed to you, all the photos you set up in FrameIt, or all the photos on a memory card, but you can’t mix them all together. I picture giving a gift like this to my parents and telling them to just keep it turned on and wait for new photos to show up. Since the e-mail function can’t do that automatically, anyone who wanted to send them photos would have to use FrameIt, which is all controlled by one Microsoft user’s account. I can’t tell you how badly I wish that e-mail feature was automated so their friends and family could just zip photos off to the frame’s built-in e-mail address. Finally, there’s no user manual included with the frame. There’s a quick start guide that directs you to a website to download the full manual as a PDF file but the link to said manual says “Coming Soon” – seriously? And the link to download the desktop software is under the “Tutorials” section of the product page. It took me all afternoon to figure out how to set the frame up for use with FrameIt. The user interface works fine and your computer and the frame can communicate over Wi-Fi or via USB but it’s not much to look at and it takes a while for the program to open. It handles drag and drop, which is nice, but it doesn’t do much else. Also, make sure your photos are some multiple of 800×600 or they’ll show up with black bars on the sides or on the top and bottom of each photos. My Canon DSLR shoots at a slightly widened ratio, so most of my photos have the bars. Regular point and shoot cameras should be okay, though, as long as they’re not set at 16:9. All the negatives aside, once you figure out the frame and get everything working it makes a nice addition to the living room. If you’re savvy enough to figure out how to add the RSS feeds of your photo sharing accounts, adding future images is a cakewalk. This is not a frame you’d give to an average person and expect them to use any of the cool data-centric features, though. They’d be better off with a frame that just read memory cards. However if you can put up with a little behind-the-scenes wheel-spinning at first, the fit and finish of the SPX8WF and the big, bright screen make it a pretty decent choice as far as full-featured frames go.